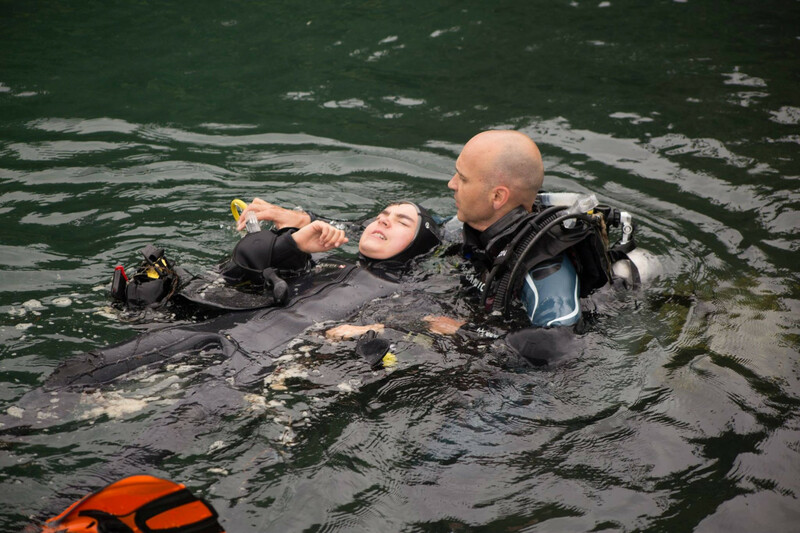 Some people say the PADI Rescue course is one of the most challenging, but rewarding courses they've ever done. Stop. Think. Act. Building on what you've already learned, the Rescue course expands your skills and knowledge, teaching you how to prevent problems when diving, and how to manage them when they occur. In the PADI rescue course, divers begin thinking about others, rather than just themselves, building your confidence and making you a better buddy. It's also a vital step towards higher levels of training. Starting in the classroom, we'll cover topics such as The Psychology of Rescue, Being Prepared for Diver Emergencies, Accident Management & Responding to Diver Emergencies. We'll then head to the pool to learn and practice some of the skills we'll use in the open water. Finally, we head to the sea where we'll practice those skills before putting them into practice in the rescue scenarios. Upon completion, you'll be a PADI Rescue Diver (and Emergency First Responder, if combined with Primary & Secondary care), and equipped to confidently handle emergencies you, your buddy or another diver, hopefully never encounter. We usually run our Rescue Diver course over three days and an evening: You complete the manual, bringing your completed knowledge reviews along to the course. We spend an evening on knowledge development. Our first day is spent in the pool. Two days spent in the sea. What's next? Now that you've completed Rescue Diver, you can go on to PADI Divemaster, or explore areas of diving you're interested in with one of our Specialty Diver courses.